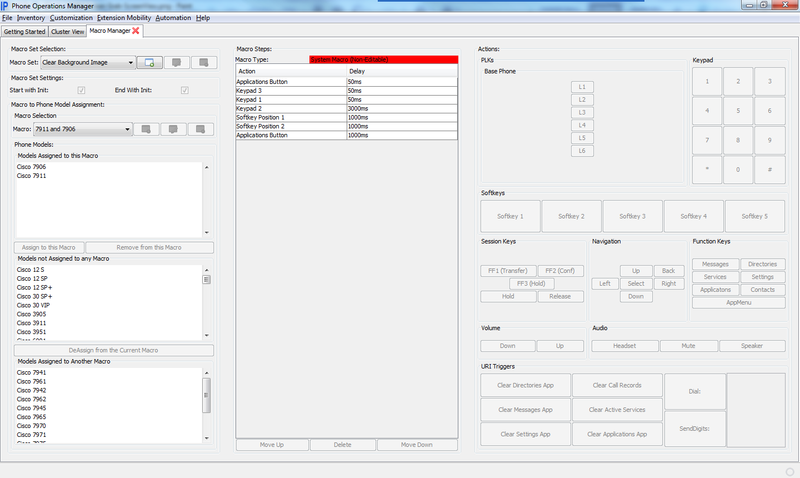 Phone Operations Manager incorporates our previous EMSnap and Phone Inventory Manager tools and the functionality of the Phone Customization Manager, and adds many new capabilities. It is ideal for Unified Communications engineers or support staff, allowing you to see and interact with phones as the user does, without leaving your desk! Cut down your support costs - remove the cost and need for remote site visits or floor walking your buildings by remotely viewing and controlling the phones on your system. 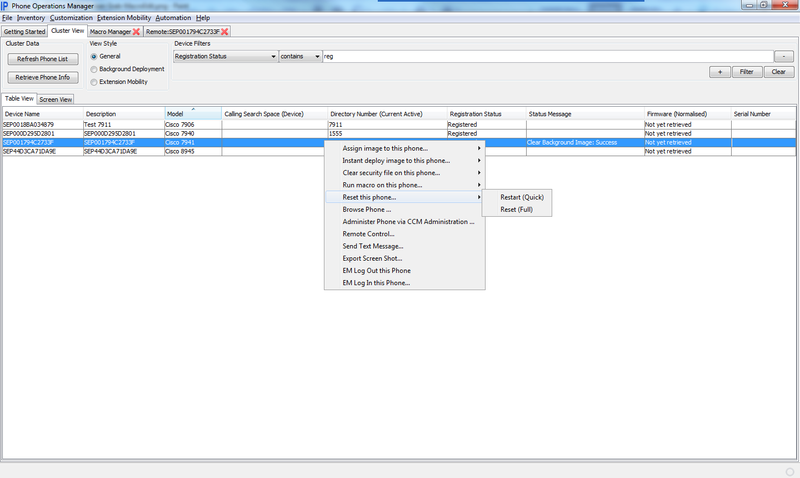 Screen View - view the screens of all phones on your cluster, and perform actions such as resets, launching the CCM Admin page for that specific phone, browsing to the phone, controlling Extension Mobility, sending a text message, or fully remote controlling the phone from a simple right-click menu. Table View - display all phones on the cluster in a more data-centric manner, with preset views for typical functions, and fully customisable layouts and column selection. Select one, many or all phones to perform actions such as resets, launching the CCM Admin page for that specific phone, browsing to the phone, controlling Extension Mobility, sending a text message, or fully remote controlling the phone from a simple right-click menu. Remote Control - remotely press buttons on the phone and see their effect on the automatically updating phone screen to demonstrate functionality to users or to test phones after maintenance or other activities. 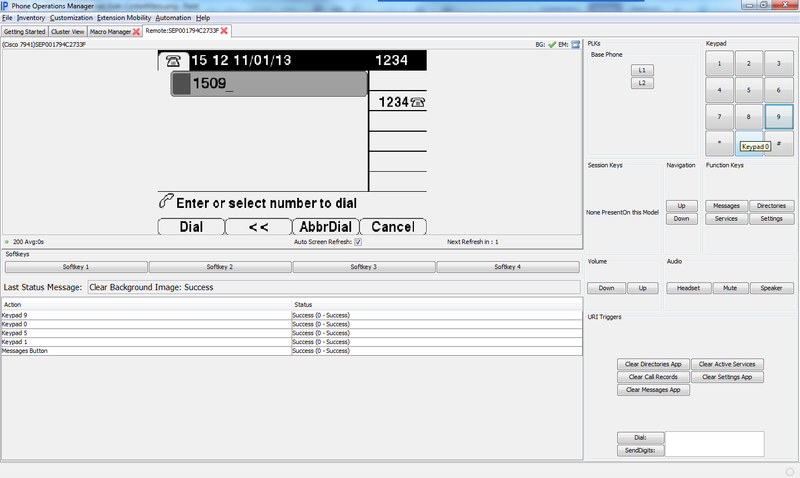 Quickly enter numbers into the dial box to dial test numbers, and access all the other functions via a simple right click menu such as resets, CCM Administration shortcut, and text messaging. Export Screen Shots - capture phone displays from remote phones during remote control sessions or from screen view to assist with creation of user documentation or capturing error messages. 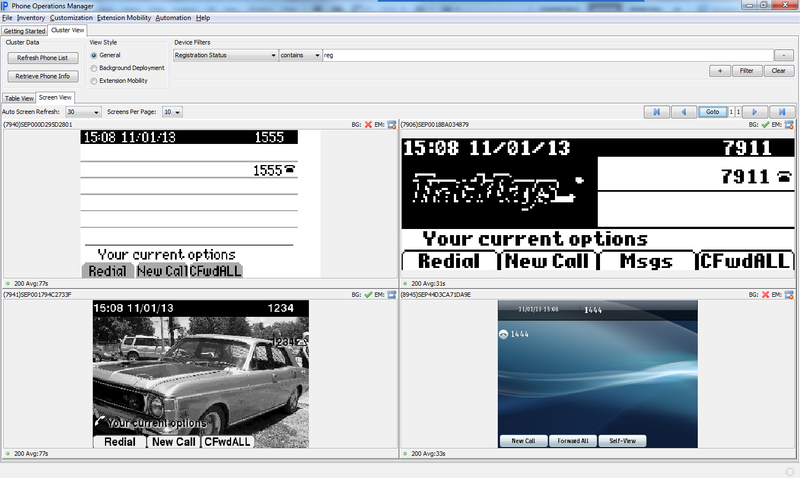 Quickly apply corporate branding - deploy any standard image to all the phones on your system in minutes from your desk. This application quickly generates customisable images for every phone model type, and pushes them out to the phones. Verify your results with Screen View! Control Extension Mobility - export all logged in users to a CSV to allow maintenance of your system such as upgrades or bulk reconfiguration, and then restore all logins from that CSV file to the cluster to make the change seamless for users. Alternatively you can log in or out any phone individually from your helpdesk. Send Text Messages - send informational messages to the phones, such as system status alerts, maintenance notifications, message of the day. Gather and Export Inventory data - gather configuration details from CUCM, and include live information such as registration status and IP addressing, as well as phone hardware information such as firmware versions, serial number and Cisco Discovery Protocol information such as the connected switch ID and port information. Clear ITL and CTL files remotely - use the built-in macros against one or many phones to remotely clear out of date or bad ITL and CTL files. The product is available in several versions; with the exception of a Site license, each license is for use on a single client PC and this is enforced by the licensing system. With the exception of the Engineer license, each license is locked to a single CUCM cluster. If you have multiple clusters you require multiple licenses or the Engineer edition. The base product includes 1 Year of email-based support and to software upgrades. An optional 3 year support term may be selected with your order, and longer-term support can be requested. If your support expires, you will be able to use continue to use the version you have, but you will not be able to use new versions or access support services. Contact sales@ipcommute.co.uk for more information.